Tiny dogs? Love them. Baby corn? Yes please. Pygmy goats? I’ll take 12. For a while, I even collected those little erasers that are shaped like food for no other reason than the fact that they were small, exact replicas of delicious things. So obviously, when I find a recipe that takes a big dish and makes it bite-sized, I’m all over it. So are Mini Vegetable Lasagnas as good as regular-sized lasagnas? Heck yeah. In fact, I think I may prefer the mini version because the wonton wrappers peek out over the edge of the muffin tins and get nice and crispy. And I love crispy things almost as much as I love small things. The best thing about this recipe is that it is highly adaptable. Use any filling and any sauce you like–as long as you stick to the assembly instructions and bake time, they’ll turn out fine. Lasagna in a muffin tin? Yes, it’s possible! These Mini Vegetable Lasagnas are made with pesto, cheese, lots of veggies, and wonton wrappers instead of lasagna noodles. Adapted from Can You Stay For Dinner’s Petite Lasagnas. Preheat oven to 375 degrees. Spray a 12-cup muffin tin with oil or cooking spray. Heat oil in large skillet over medium-high heat. Add garlic, zucchini, and mushrooms and saute until softened and just beginning to brown, about 7 minutes. Stir in artichoke hearts; cook 2-3 additional minutes or until liquid evaporates, if needed. Add sun-dried tomatoes and pesto to skillet and stir until well-combined. Remove from heat. Combine ricotta, a pinch of salt, and pepper to taste (I added 1/4 teaspoon) in a small bowl. Set aside. 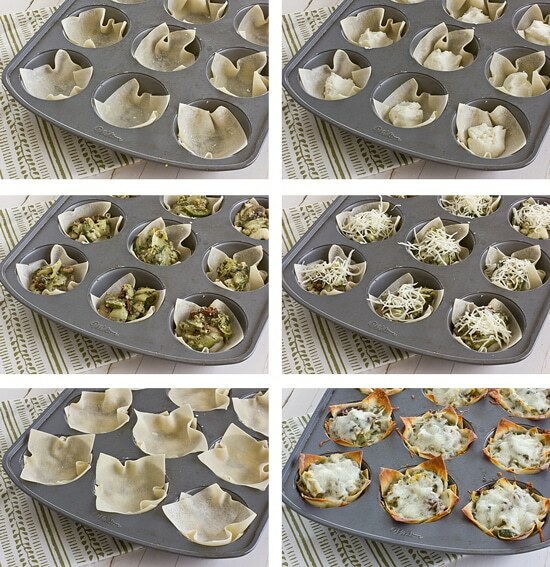 Press 1 wonton wrapper into each cup of the muffin tin. Divide half the ricotta mixture into each cup; top this with half the vegetable mixture. Divide half of the shredded cheese into each cup. 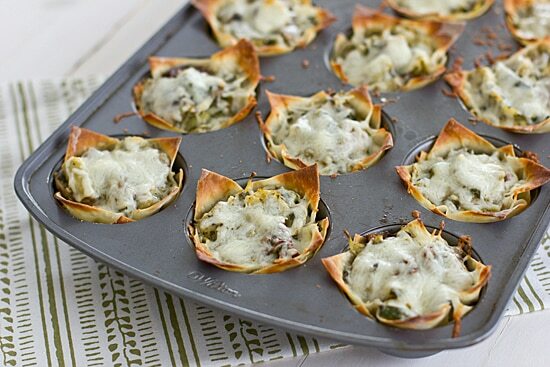 Place the remaining wonton wrappers into each cup, making sure the corners are in the opposite direction of the first wrapper; gently press down to smash everything into the cup and then repeat layering process with remaining ingredients (ricotta, veggies, then cheese). If any of this is confusing, refer to the photos above! Bake for 10 minutes, or until cheese has melted and edges of wonton wrappers are golden brown. What I Ate This Week | Quinoa, Tofu and Other Veggie Staples Garden Update | Good-bye Spring Veggies, Hello Summer! I love this recipe! I made a Mexican version last week with black beans, corn, and peppers with salsa instead of pasta sauce and jack cheese. This wonton base could be used for about anything. Love the blog! I’ve been thinking about doing a Mexican version myself–I’m glad to hear it worked out! Love this site!! Making these tonight. Filling wontons with leftover veggie chili topped with jalapenos and cheddar. Can’t wait!! I want to make this! It looks amazing. BUT, I don’t like mushrooms. Any suggestions for what I could replace them with? I’ve never tried making them in advance like that, but I think it would work! Has anyone frozen these? If so, was it before or after baking? And how to cook from a frozen state?